Írtam már erről a témáról, de részben az OS X változásai, részben az újabb és újabb nagy felbontású kijelzők miatt érdemes az aktuális állapotot felfrissíteni. Learn which Mac computers can use 4K displays and Ultra HD TVs. Also learn what the requirements are and how to set up and adjust the display or TV. You can use 4K displays and Ultra HD TVs with these Mac computers. You can use 4K displays and Ultra HD TVs at the following resolutions and refresh rates via the built-in HDMI port. The MacBook (Retina, 12-inch, Early 2015) will support these displays and rates using the USB-C Digital AV Multiport Adapter. With OS X Mavericks v10.9.3 or later, the following DisplayPort displays are supported at their default using single-stream transport at 30Hz. These computers also support multi-stream transport (MST) displays at 60 Hz. If you use a 60Hz MST display with the MacBook Pro (Retina, 15-inch, Late 2013) or iMac (Retina 5K, 27-inch, Late 2014), only one additional Thunderbolt display can be supported. Learn more about Thunderbolt ports and displays. You need to manually configure 4K displays to use MST. Follow the steps below to use the display’s built-in controls to enable this feature. 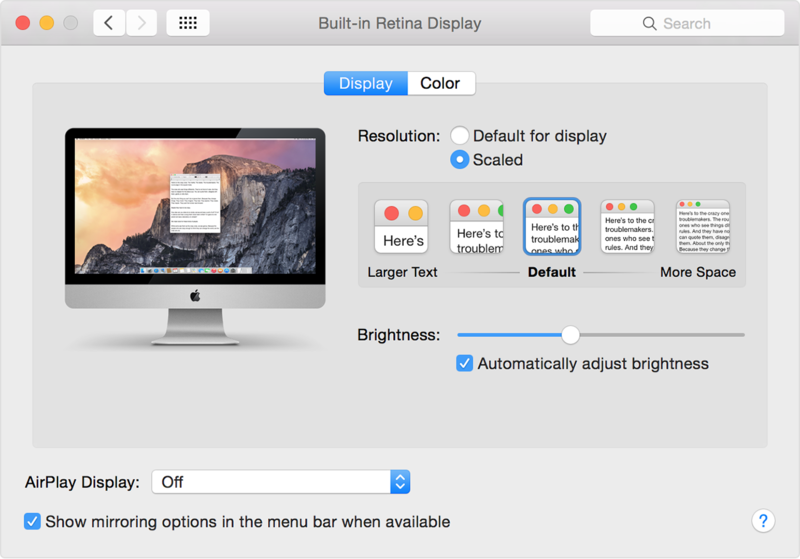 Use System Preferences > Displays to adjust or scale the resolution on your display. This can make text and objects appear larger or give you more space on your screen. Hovering your mouse over one of the resolution options will show more detail on that option. To get a Detect Displays button to appear, press the Option key. To see all the available resolutions, hold down the Option key while clicking the Scaled button. If you change display resolutions when mirroring to a 4K display or Ultra HD TV, some distortion can occur. Turn mirroring off and back on to correct this. Get the best graphics performance from your 4K display by directly attaching the display or its dongle/adapter to your Mac. Do this rather than connecting through another peripheral or device. 4K displays and Ultra HD TVs using Windows 7, 8, and 8.1 with Boot Camp use the same rules as OS X. If you upgrade from Windows 8 to 8.1, you should repair Boot Camp drivers.